Mattis Banz dreams of one day joining the Resistance to defeat the First Order, a looming post-Empire threat. 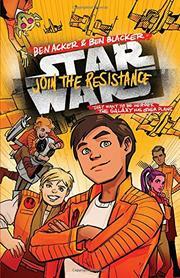 Abandoned at an orphanage, human teen Mattis imagines that his parents are Rebellion fighters who had to leave him in order to fight the Empire. Mattis doesn’t realize that he has been watched on his home planet of Durkteel by Resistance scouts who’ve noticed his leadership capabilities and now recruit him to train for the Resistance. As introduced in the film The Force Awakens, the Resistance is a splinter group that has separated from the Republic’s military, disturbed by the Republic’s passivity to the rise of the First Order. Under the leadership of Star Wars’ favorite commander, Adm. Ackbar, 14-year-old Mattis joins other new recruits, a scruffy band of young potentials who don’t always follow the rules. To teach them a lesson in discipline, Adm. Ackbar sends the squabbling crew on its first mission to the murky swamp planet of Vodran where near-death experiences force team members to overlook their differences as they encounter darker forces ahead. Fans well-read in Star Wars lore will likely find Mattis Banz something of a lightweight dreamer—not a potential hero for any rebellion. The authors stay loyal to the Star Wars tradition, offering a cliffhanger ending that holds out hope for Mattis to redeem himself in the next book.